Ras Mohammed is part of the Tentative list of Egypt in order to qualify for inclusion in the World Heritage List. Ever surfaced from a dive to be greeted by a herd of dromedary camel herd? Going diving at Sharm el-Sheikh gives you an easy opportunity to go diving at Ras Mohammed National Park. The fuel costs to go that extra bit means the dive shop will charge you more but it's totally worth it. You can of course stay close to the park if you plan on dive there for longer and they shouldn't charge you extra for the trip. The fragile corals in the park are at high risk according to the management, in part they say due to divers and snorkelers. I've seen my good share of bad diving behavior and snorkelers can easily reach the shallow soft corals from the surface, with trampling being the main cause for concern - you can't and shouldn't walk/sit on corals! More protection would improve the state of the park's shoreline ecology. Another reason this park is at risk because every boat that comes in, may it be dive boats (who usually know better and use anchor lines), private yachts or cruise ships will drop the anchor and do a huge amount of damage in little time. This is Palawan all over again. 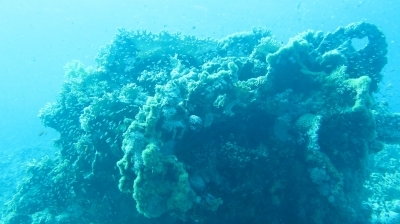 Aside from the direct impact within the park, other problems include pollution that stems from over-development along the coast, dredging, pollution, sedimentation, sewage drains all ending up in the red sea. The park itself is helpless against this problem. My recommendation for this site would be to inscribe but put at risk immediately.